Cremationurnsashes.com offers you affordable urns to save memorial ashes of your loved ones, who have left us with only their memories to be cherished. Funeral urns for ashes are one of the best options to lay our deceased loved ones ashes to rest peacefully and appropriately. Cremation urns ashes offers different types of personalised urns at discount prices, such as Full-size Large urns, Keepsake Small urns for adults to hold the full/token ashes, pet ash urn, keepsake child urns, mini baby urns, cremation jewellery urns, medium size infant urns to suit the personality or taste of your loved one. Heart shaped pet urns for ashes of dog & cat are also available for keepsake ashes in several designs and colors. Our perfect memorial urns catalogue has verity of vases for cremation that suits even to the decor of your home. All these human urns for ashes in the UK are made up of high quality solid brass material and small keepsake urns for ashes are available in different mini colorful sizes and teardrop & dome top designs. 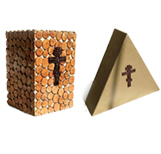 Cremationurnsashes.com offers different sizes of memorial urns either to hold all the cremation remains of an adult cremation urns, mom urns, dad urns and pet urns to hold just a few teaspoons of the memory as a keepsake (distributed among the family). The sizes of the affordable urns for ashes can vary from standard (200 cubic inches) to very small (50 cubic inches). As for the colour choices, the sky's the limit. To suit the personality of the loved one, the colour choices can be anywhere from bright, playful colours to elegant, sophisticated colours. Depending on the type of memorial setting, the material of the urn can be chosen. For an outdoor setting or direct burial of the remains, bronze and steel are the best options. For the urn to add to the interior decor, wood and glass would be good. If you need to scatter the ashes and you are looking for a biodegradable option, then cardboard or paper urns are the best options. Our selection of personalized funeral urns are heightened with the array of designs they are available in. Adult Cremation urns can be used to reflect the tastes or hobbies of the loved one and can be made to be as unique as possible. The never ending list of choices includes traditional vases, Grecian urns, sporting goods, kitchen ware, jewelry boxes, memorial rocks, and so on. Cremationurnsashes.com offers you the best inexpensive small urns, dog urns for ashes, brass cat urns, child/baby/infant urns, adult urns and jewellery urns for funeral ceremony to represent your loved one's memories. By personally selecting our handmade urns to hold the cremated remains, you can honour and cherish all the ways your loved ones brought happiness to your life. We (Cremationurnsashes.com) are the UK's trusted online retailer of urns products since 5 years by offering free shipping and same day dispatch to UK customers. Our customer support team will help you in all the aspects from selecting the best urn product and return of the product in case of any damages occurred. Cremationurnsashes.com will make sure to provide quality urns, which are handcrafted by specialist artisans at cheapest prices than our competitors. We guarantee you on low prices and quality services. So, what are you waiting for? Choose a best and suitable urn and place an order online and receive the product quickly. Keepsake Urns will preserve a small amount of cremation ashes and you can use this keepsake urn as a home decor as it can be placed any place of your home because of size of the product. We are offering memorial keepsake urns in different colours with different finishing and all the funeral keepsake urns products are made by using solid brass materials. Buy keepsake urns online and get discount prices and free shipping and same day dispatch. We are specialists in designing and manufacturing adult urns for cremation ashes in UK. All the adult urns products are made with solid brass material and will help to show the respect for the deceased loved one. Get quality and reliable services like low prices compare to high street prices in UK with free shipping and same day dispatch from the UK’s trusted online retailer of urns products. Pet Urns for Cremation Ashes are hand-casted in brass material by specialist artisans. We are offering cat urns and memorial dog urns for cremation ashes under the category of pet urns. The beautiful pet urns will help to hold the memories of your loved pet alive with you. Place the order today with us and get free shipping and same day dispatch on all the products of pet urns for ashes. All the Child Urns for ashes products are made with solid brass material and hand finished by skilled craftsmen. Choose the best baby urn for memorials from our wide range of urn inventory and get discount prices up to 75% and same day dispatch with free shipping. Cremation Child Urns for Ashes are available in different colours like blue, red, pink and many more colours. We offer high quality cremation jewellery urns with wide range of styles like pendants for ashes, necklace, bangles, bracelets & lockets which are made of 316L stainless steel. The memorial jewellery urns holds a token amount of ashes (half tablespoon) and also handy for those who choose scattering ashes. Cremation jewellery urns can keep memories close to your heart and holds something precious for a lifetime. All our jewellery urns are professionally designed by the skilled artists and handmade with high quality standards.